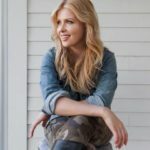 A reader of this site recently asked me to do a blog post on what tools are needed for home butchering, so this is for you girlfriend. 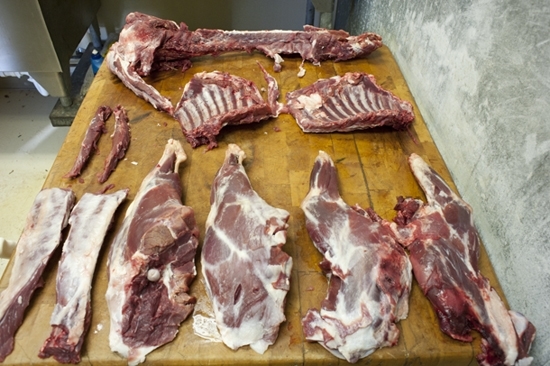 Home butchering is such a fun past time, and if you learn how to do it yourself you can save a lot of money. Buying a whole animal from a farm, for example, will allow you to break it down into all of its important parts and store them separately, make the bones into nourishing stock, and fill your freezer for the year. You can share the cost of a whole animal with friends and do all of this butchering together. Friends that butcher together stay… never mind. It doesn’t have the same ring to it. Here are the important tools for butchering. If you have anything to add, please share in the comments! 1. First off, you need a butchering workbench. This can be a large metal work table, but I like wood. Don’t worry about the blood, you can sanitize with a lot of salt and a dry brush later. 2. A curved knife it also important, but various sizes are good because sometimes you need to get into crevices or work with smaller animals. 3. Fat will dull your knife faster than pretty much anything else. You must, must, must have a diamond sharpener for all of the knives in your life. Things go so much more smoothly. 4. You will also need a meat saw. That is how you separate the major bones into more manageable pieces, particularly the spine. 5. Because this is serious work, you’ll need some heavy duty butcher gloves to protect your hands from bones and knives. I’ve gotten plenty of small cuts on my hands and they are a nuisance. These are good. They also come in more expensive metal versions. 6. I get teased for butchering animals in white clothing, but I ain’t scared o’ no blood. Nevertheless, a waterproof apron is useful, since you’ll be hosing things down and getting elbow deep in some serious stuff. Blood does stain. 7. I love my meat grinder because it also works as a sausage stuffer. All of those extra bits and scraps of meat that don’t seem to belong to a particular cut can become sausage. Turn it into this recipe for example and you will have delicious sausage at breakfast every day. 8. A food saver is a popular item for storing protein because it helps remove all of the air from the bag before it goes into a freezer, ensuring that it lasts longer and doesn’t get freezer burn in the process. If you find you are going to be processing a lot of your own meat or fish, this is a worthwhile investment. Those are on the top of my gear list, my friends. Feel free to add your tips in the comments! May your future be meaty and bright! Yes, I have a dehydrator but you can also use your oven to dehydrate, just make sure it is on a low temperature, sometimes you need to keep the oven door propped open! Thanks Georgia. OK neighbor said we could have half a steer of his from our pasture. Trying to buy heavy duty deluxe used equipment to save money. We bid on a used 9 tray dehydrator with timer. Seen meat grinders. Some “super deluxe heavy duty electric, some deluxe heavy duty manual” . Do you recommend heavy duty electric or heavy duty manual meat grinders? Going slow to set up our butchery room like you have .Want to get extra freezer, the dehydrator, and the vacuum sealer to preserve all this food. Next try canning. Wife said if this butchery room turns out good/saving money she gives her blessing me going hunting with the guys ( lots of target shooting,never hunted, maybe get an Elk or Mule deer or split one someone else shoots). Electric meat grinders are the way to go, it will be much easier to process the meat efficiently I think. Bravo to you and your wife for setting up your own butchery room! Let us know how it turns out. Oh, thank you. Just what I needed. I read you notes on preserving lemons. Have you tried to use your food saver or would that not work? I enjoy your page even though I a guy hunter, great tips for us older single fellows. You can use a foodsaver for that but you don’t need it, you can also just use a glass jar with a lid since you are storing them at room temperature! I would like to add that you CAN butcher with way less gadgets and gizmos. My friends and I have a great time cutting deer, pork and chicken on my kitchen table with a boning knife, cutting board, sharpening steel and some butcher paper. I recently purchased and grinder/meat stuffer that is fun for making sausages. Please don’t think you NEED all these things, just give it a shot! What Blayne says is true. You don’t need all these things to start with. The grinder is a big expense especially if you aren’t sure if you enjoy butchering. If you look around you can find butcher shops that will do grinding for you and it will still cost less than having a whole animal done. When you do decide to make the leap and buy a grinder, you want to buy a quality, heavy duty grinder. There are many small grinders out there meant for light duty use but they will quickly wear out when using them for larger projects. Also, look for auctions or on E-bay or Craigs list for used commercial grinders. We bought one through a newspaper ad, a full on commercial grinder and only paid 150-dollars when new would have cost about 600 and for our purposes (processing 6-10 deer a year) will probably last forever. Yes, wow, what a pricey and excessive list of butchering tools especially if you are not processing commercially. We use a filet knife and cutting board when butchering our fall harvest of elk, deer and antelope. A knife sharpener is a must as we probably sharpen our knives every hour when processing an animal. A tight wrap w/ saran followed by freezer paper works as well as a vacuum sealer, is much faster and you don’t have to buy those pricey plastic vacuum bags. We bought the meat grinder and sausage stuffing attachment for our KitchenAid mixer which works well and we can easily grind 15-20lbs in an hour. Ah, looking forward to hunting season already! I notice you don’t recommend a cleaver. A good cleaver can save time, faster than sawing in those cases where it’ll work. That is a really good list. I also grind in my food processor, in small batches. I like that chopped quality. In my opinion, butchering a carcass is a great time; I guess because it involves learning an art, and it helps you learn a little bit about the human body as well. Also, if you can butcher cuts of meat bought at the local grocer, you can make them more tender, and even taste better. I think maybe you should include some video of how to properly slice certain cuts of meat, something I may consider posting on my own blog, but I am sure you will look a lot better doing it. Great blog on the naturalistic approach to living. Maybe one day I will get around to the peaceful lifestyle of working with the land. Im a deer hunter and starting last year the meat lockers stopped taking whole deer. So had the fun experience of skinning, debonning my deer. For the most part things went fairly well. The thing i had big problems with was the hair. Is there a secret to dealing and getting rid of hair? Appreciate any feedback. I just skin it and then I ultimately rinse the meat and my hands before packaging it up and it removes any deer hair. Love to ladies working on the meat. I would love to grind those PIECES and make SAUSAGES. hello Georgia, this is a very informative post.I get lots of idea from here.my husband will happy after seeing this.he loves to cook.thanks for this nice post. Thank you for the list! I would add that if your wife has a Kitchen Aid and you’re doing a deer or other large game that the meat grinder attachment works fine, but you’ll want a better grinder. I use the STX-3000-TF-PD because it comes with a pedal so I can start and stop it while doing sausage stuffing. Also, you can do a butcher block counter top for much less than a finished butcher block in the size needed (I suggest 60″X 30″). You’ll need to treat it every few weeks with mineral oil and then of course use course salt to clean. Lastly, a way to hang a CARCASS such as a gambrel hunt from a pulley attached to a joist in your ceiling. There are ways to set them up with a crank so you can raise and lower as you skin. I use one to remove the front quarters, strip sirloin (backstraps), flank meat and rib meat, then saw off the backbone at the hips and debone the hind quarters before moving to the cutting board. Then again, I’m processing mainly game. Great tips Wayne! Thanks for sharing them with everyone.